An appeal by Newbuildings players against the Coleraine batsman Scott Campbell, during their North West senior cup 1st round match at Foyle. INLS 2115-7398MT. There were no shocks in the first round of the Danske Bank Senior Cup with five sides being bowled out for less than 80 runs. Holders Donemana travelled to Bonds Glen and won convincingly by nine wickets after the Bee Gees were all out for just 72. Last season’s beaten finalists Brigade were given a fright when they entertained neighbours Glendermott the visitors scored 164 and Brigade lost seven wickets in reply. 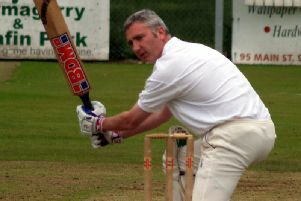 Strabane’s woes continued when they lost by five wickets at home to Bready, the Red Caps slumped from 165 for 1 to 226 all out and David Scanlon’s side lost just five wickets in their chase. Coleraine were given a scare away at Newbuildings the game played at Foyle College, the Bannsiders made just 146 but shot out their opponents for just 64. Fox Lodge fared even worse as they could only manage 60 chasing Eglinton’s 219. St Johnston had the lowest total of the day when they could manage just 49 at home to Ardmore that took them 36.1 overs, the Bleachgreen men winning by seven wickets. Drummond had the highest score of the day at Creevedonnell making 327 before the home side could only muster 77 in reply. Killyclooney travelled to Burndennett and won comfortably by 64 runs they scored 238 for 7 with the home side replying with 174.